At any one point in the United States there’s some 60,000 prisoners in some sort of solitary confinement. The NSA and GCHQ have been sucking up all our personal communication, and their capabilities have been doubling every 18 months. The ability to surveil everyone on the planet is almost there, and will arguably be there in a few years. And to store that data. Historically the NSA has run its PR campaign based on not existing. When a lot of info came out, NSA gave an aggressive response. Totalitarian dystopia in the sense that the surveillance is total, so that no one can exist outside the state…. The Internet about 4 years ago was a politically apathetic space. 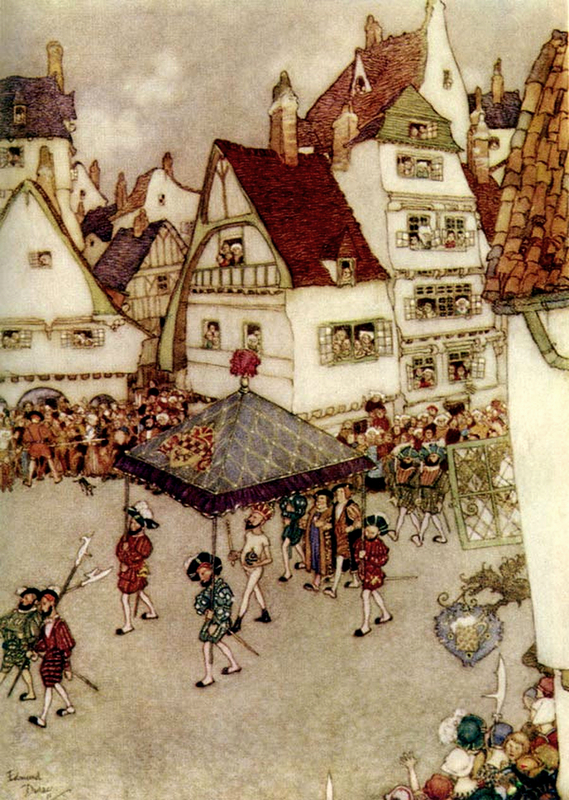 There were gradually developments, e.g. Anonymous vs Scientology. Harrison (UK), Poitras (US), Appelbaum (US) are now all in effective exile in Berlin. NatSec reporters are a new type of refugee. [Answering a question about how he started] We saw that cryptography would liberate people in a very important way. It would help those trying to hold the state accountable. It became clear to me that one of the best ways to achieve justice is to expose injustice. When we published the manuals from GITMO, there in those manuals in black in white is ‘hide things from the Red Cross’. Just this week, Gen. Alexander making comments at GW University that soon there’d be a media leaks bill to try & stop publication. Now that the Internet has merged with human society, the laws that apply to the internet apply to human society. We know what happens when a government gets serious: someone gets fired, prosecuted, etc. These have not happened to the NSA. The reform doesn’t appear like it’s going to come out of the govt. Indicatitive of the deep state, the power of the intelligence agencies. You’ve got no choice. You can no longer hide from the state or keep your head down. Arbitrary justice is arbitrary. We are now all involved in it. We are all part of the state. We have no choice but to attempt to manage it. We are educating each other at an unprecedented speed. 20 year olds today are much more educated than 20 year olds 10 years ago. Yes, we have upcoming leaks, but we don’t like to give the opponent too much of a heads up. The Crimea region is so geopolitically important to Russia that they’re willing to pour immense resources into retaining it. The big lessons are not geo-strategic lessons. We were ready for that fight. It’s more how people you trust behave under pressure. The big lessons are not geostrategic lessons. We were ready for that fight. It’s more how people you trust behave under pressure. We’re all living in a world that we don’t actually understand. Before all these disclosures, we were living in some illusion. We are walking around constantly in this fog where we can’t see the ground. These disclosures are a break in the fog. In some ways I feel the fear more keenly, so I can perceive the way things are going in different ways. Courage is not the absence of fear; only a fool has no fear. Courage is seeing the fear and continuing to proceed. Power is a thing of perception. They don’t need to be able to kill you. They just need you to think they are able to kill you. The Pentagon in 2010 demanded we destroy all previous and upcoming publications. And we said ‘no’. We’re a small publisher. We try and test. We do not accept the perception of fear, we push to see what is the reality. Google & other big companies are in the business of collecting as much info as possible. You are the product. Swedish govt is having a lot of intervention in Ukraine. Ukraine’s ‘Orange Revolution’ betrayed the people”. “Militarization of our civilian space”, that is how Assange describes the invasion of NSA. A Swedish Extremist Right-wing “Diplomacy”? 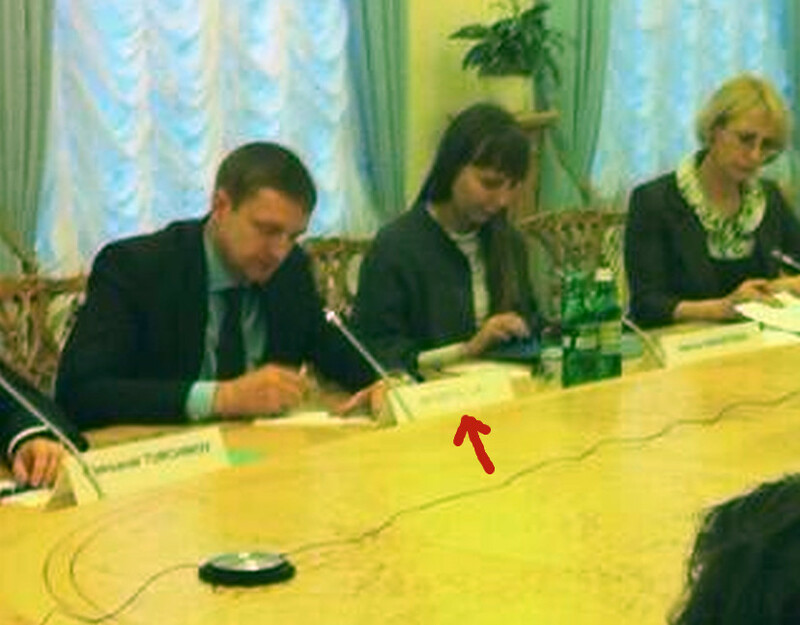 Or Bildt’s Support To Ukraine Nationalists? On the extreme anti-Russian provocations of Sweden’s Foreign Minister. 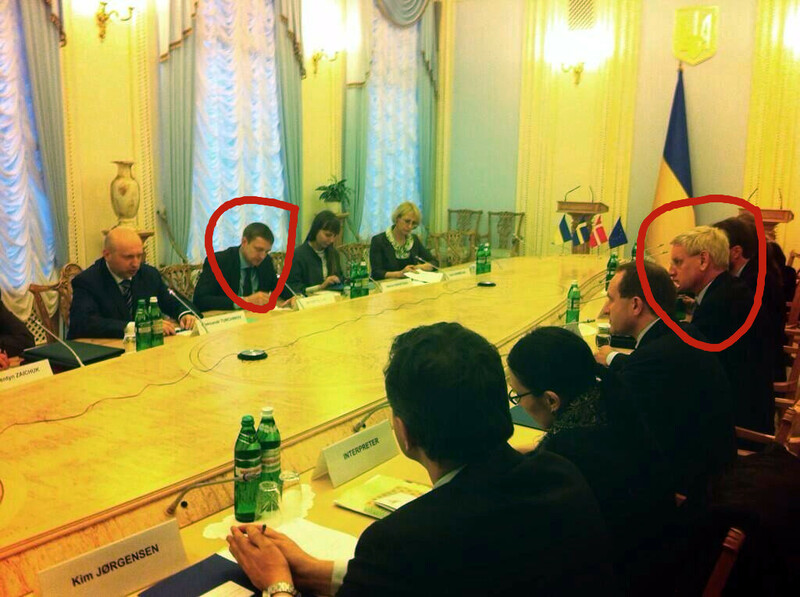 And, why the name of the Svoboda Party leader Oleh Tyahnybok has been ‘Photoshop’-bleached in the picture twitted by Carl Bildt? I am certain that many remember, at least in Sweden, the TV scenes showing Carld Bildt participating in the protracted Kiev demonstration. Although many demonstrators apparently professed discontent towards the government on the issue “EU-membership”, those were not spontaneous demonstrations. Not at all. 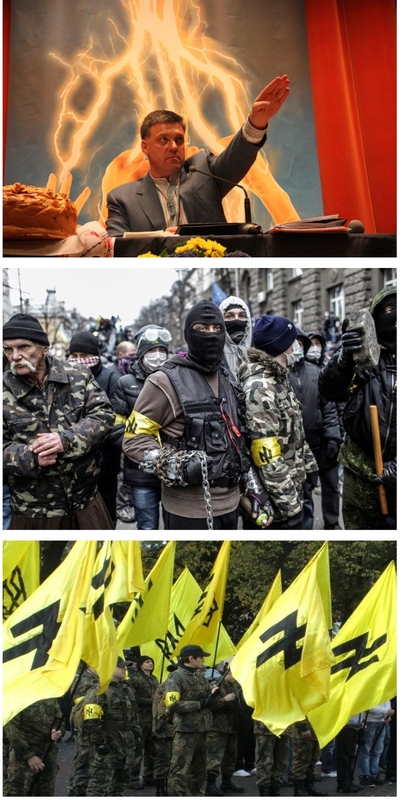 Those were at heart and by design anti-Russian demonstrations orchestrated by a constellation of neo-Nazi and so-called “nationalist” organizations supported a) by the US Embassy, and b) by a group of hard-liners at the top of the EU, mainly represented by Carl Bildt. For instance, in a telephone talk between the US Assistant Secretary of State Victoria Nuland and the US Ambassador to Ukraine Geoffrey Pyatt, it emerges that the appointment of Arseniy Yatsenyuk as leader of the country after the coup, it was a puppet installation by the US envoys (See the video here). Further, about the snipers-killings of demonstrators, which was one strongest factor used to catalyze the fall of the ex-government, it has been now reported it was a job ordered by the Maidan leaders, which allegedly hired the snipers. Later, however, the “diplomatic behaviour” that Sweden’s Foreign Minister Carl Bildt exhibited in support to the new leadership in Ukraine went really out-of-order. At least judging from what has been widely referred in the Swedish press. And it is a fair criticism. Even for Bildt’s own standards (in my humble opinion, a “diplomatic behaviour” that has been more devoted to represent NATO’s interests, or the interests of global-finance such as those nucleated around the Bilderberg-Group and the like, than on behalf of Sweden) his extreme-biased utterances have been unique; and they pictured him rather as a simple fanatic right-wing extremist. That cannot represent what the Swedish people think at large. Even the conservative Prime Minster Fredrik Reindfeldt has produced declarations on the Russia/Ukraine crisis that contradicts or “soft down” the utterances of his own foreign minister. Unfortunately, what is heard in the world as Sweden’s official voice, is only Bildt’s voice. A leaked document obtained by a prominent journalist of Channel 4, showed that Bildt put forward in the closed-doors meeting with his EU colleagues that: “EU cannot accept a Russia’s alleged right to intervene in another country (on the reason of) their countrymen”. In another occasion, he compared the former Ukraine president with the Norwegian Nazi Quisling. To the consternation of the Swedish journalists interviewing him, he kept on afterwards repeating such comparison. 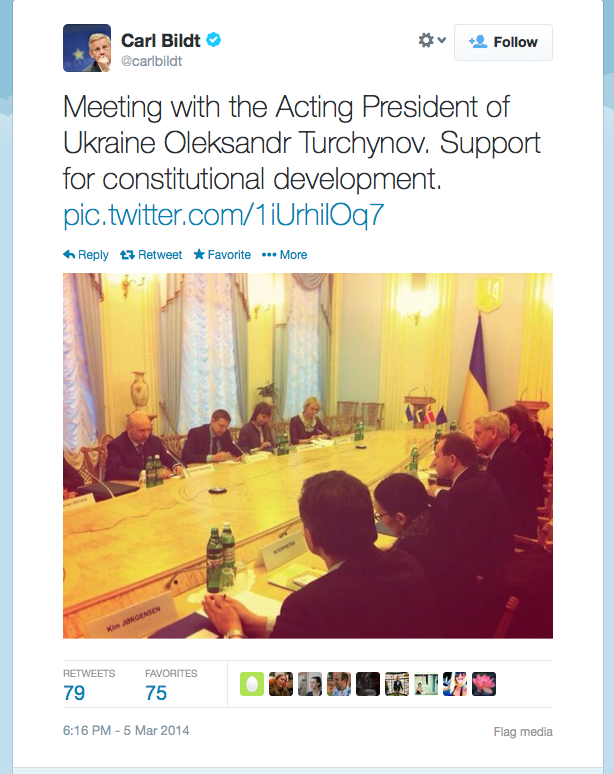 Now Bildt has proudly twitted on his meetings in support of the new Ukraine leadership. He even twitted a picture. And there are a few markedly facts about this picture, worth an analysis. While conducting the supervision of a Master Thesis in the subject injury epidemiology at the Karolinska Institutet,  I came to the reflexion that the actual number of fatalities in war-related events such as combats or air strikes, might be significantly higher than those reported in the “body counting” sites, also used as sources by the media. After nearly four years of the message in Professors blogg on the case Assange, my 250 analyses and articles, one book, and nearly 1,000 comments, I have to admit that the international debate on the Swedish case against Assange is still futilely devoted to “the legal aspects” of the case. The discussion has been made up from the beginning around “technical” arguments, and where court verdicts or utterances of legal folks have been paramount attraction. As an illustration, the Swedish online forum Flashback, mainly dealing around such legal aspects, has produced up to now nearly sixty thousand comments (N= 59 257) that have been viewed nearly six million times (N= 5 723 806). And from the part of the Swedish press, the only opinion articles accepted for publication on WikiLeaks or its founder Julian Assange are those bound to contribute to the “legal discussion”, hence, towards the ever blowing smoke-curtain encouraged to hide the real case. Likewise, as soon the establishment’s media monopoly prints a declaration – often repetitions – by lawyers working for the perpetuation of the “Assange case”, the international social media is inundated with exegetic comments trying in vain to elucidate if any novelty might be at sight. Like when the people tried to describe the Emperors clothes while he walked in front of them, as blunt naked as his deceiving. My position is instead: there is not such a “legal case”; it has never been. Plainly: there is not legal ground for a prosecution of Assange in Sweden on the base of the alleged behaviours. Arguments from the part of the Swedish prosecutors in the form of vague insinuations of “undisclosed” reasons for pursuing the issue of an interrogation with Assange (at the same time that they neglect carrying out such interrogation in London) emerges after four years as a pure and simple bluff. And this bluff shall be certainly “called” if an interrogation ever is to be performed. Ergo, the case is postponed indefinitely. Which in turn explains the unreasonable reiteration of the prosecutor’s bluff done recently by Claes Borgström, on that the interrogation of Assange should take place in Sweden. For both the prosecutor and Borgström – and for that part the Swedish legal establishment as a whole – are certain that, unless the Swedish government would not issue guaranties about no-rendition of Assange to the USA, Julian Assange will never risk travelling to Sweden. After all, as already recorded in History, the company Bodtsröm & Borgström, in the person of former Justice minister Thomas Bodström, has allegedly its hands blooded with the rendition to the CIA of prisoners kept in Swedish territory to be transported for torture elsewhere. To the best of my knowledge, Claes Bogström has never publicly taken stance against such deeds, or commented his own main partner and political peer Thomas Bodström on that issue. So, in my opinion, what it is required about this case’s stalemate is to shift from the time-consuming developing on the legal technicalities that actually refer to a non-existing “legal case”. What it is necessary is a creative international criticism changing focus to the actual political plot and the denouncing of its main actors. In other words, when nearly four years has passed, may I ask to realize that, in the public march against “Assange”, the legal garments of Emperor Sweden have never existed? For in the main, the Swedish Versus Assange case has aimed from the beginning to disrupt the publishing endeavour of the anti-secret organization WikiLeaks. It emerges now clearer that the “Assange prosecution-case” might have simply been a request from the US government. And most interesting, the dialectics of this deception is double fold. On the one hand explains the diathesis of the case, its origins and bogus character; on the other hand it explains the impossible situation of the Swedish prosecution authority. They cannot afford to finish the interrogation, now under the world scrutiny, because the bluff would be called of when the public will realize that there has never been a legal base for initiating such prosecution – after that it was dismissed by Chief-Prosecutor Eva Finné in 2010. This being the genuine reason for the excuse-finding series produced for the protracting of the case; such as the last publication in SvD by politician Borgström, mentioned above. The same regarding the bogus European Arresting Warrant issued nominally by Chief Prosecutor Marianne Ny and publicly defended by Prosecutor-General Anders Perklev; as I explained in a recent analysis, such EAW had as real target not the detention of Assange, but the creation of an extradition process leading to the subsequent stalemate of the case and the immobilization of the WikiLeaks founder. 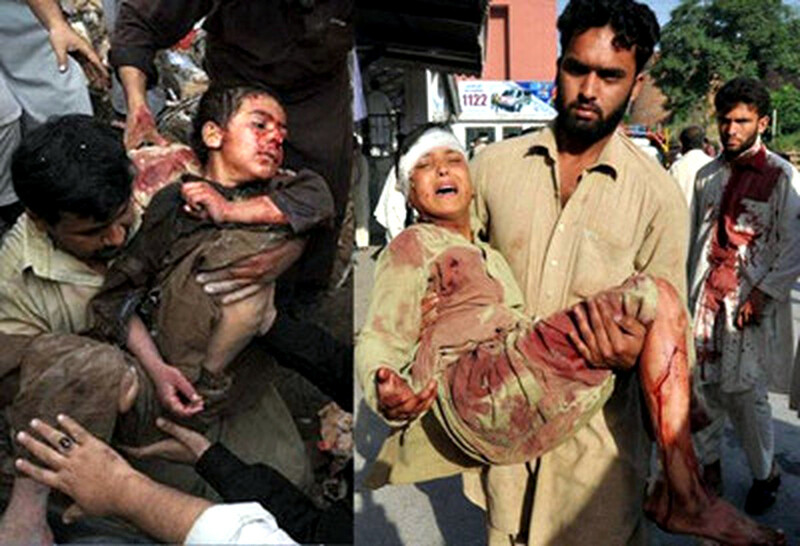 It is highly the time we denounce this in the first place and mobilise in accordance politically. For the deadlock of a political case can only be broken down by political means. In these days, new revelations published by The Intercept (18 February 2014) on US efforts to get Assange prosecuted by allies elsewhere, confirm to a great extent main theses that I have put forward on the Assange case 2010 and onwards. Although the Greenwald & Gallagher revelations in those regards are not new (for the same information has been released on at lest two occasions in 2010, see below), this new actualization has deserved widespread attention. Partly, for the information it was ascribed to Edward Snowden documents, and partly because it comes almost simultaneously with the publication by Alexa O’Brien (17 February 2014) of a thorough and inedited documentation she obtained, pointing to the US preparations for indicting Assange and WikiLeaks. In agreement with the author, I newly republished Alexa O’Brien’s documented analysis in Professors blogg. in In this article I discuss the above-mentioned findings and actualizations against the backdrop of the Swedish political-prosecution itinerary. Finally in this Introduction, I wish to state that my contention on a paramount political diathesis of the case is not a “working hypothesis”, or much less a “conspiracy theory” – as Expressen’s Editor-in-Chief Tomas Matson referred to my standpoints in a debate with him at Swedish Radio One. I am a Swedish/US educated scientist, not a Swedish journalist;  and I am professor of empirically based medical sciences, not else. Meaning: my analyses on the Swedish case against Assange are not other than the review of facts as they have truly happened in the societies involved. And, beyond opinions, I have never met a rebuttal on the facts I have put forward. It should be clarified, as also is stated in The Intercept article, that findings refers to an early publication, or “scoop”, done by Philip Shenon, former NYT investigative reporter. He published his report on US urging allies hounding Julian Assange and WikiLeaks already on the 10 of June 2010, in the Dailybeast. 2. The revealing silence on The Intercept revelations from the part of the Swedish authorities and media. After five days of the Intercept scoop, particularly when the item concerning WikiLeaks and Assange has been referred in principal international media outlets, not a single word has been uttered by the Swedish press or broadcasting services, public or private. This, considering that according to Google, the item referred by the scoop of Greenwald & Gallagher to Assange and Wikileaks in conjunction to “prosecution”, has been referred 402 000 times on the Web so far in these five days. The scandalous touch is given by SvD. The paper is running today (23 of February) an extensive article in the Culture section precisely on the theme of Edward Snowden’s exposures and in the main context of The Guardian journalist Luke Harding’s book ”The Snowden files”. The title is even headed “A matchless reportage on Snowden and the scoop of all times”. The article even reports expressly the launching of The Intercept, “completely aimed at exposures based on the Snowden documents”. But WikiLeaks is only mentioned in the article as an organization once despised by Snowden; and Greenwald is only portrayed as a bitter journalist “irritated that Harding has stolen his scoop”. And about the WikiLeaks founder Julian Assange as a target for international prosecution as described in that launching of The Intercept? Not a word. “USA dominates parliament’s distorted worldview”. interventions on foreign policy done in the Parliament during the last decade. But it was not clear difference among the Swedish parties. This is the country were even the former feminist Communist Party, which changed the name to “Vänster” (means “Left”), voted for Carl Bildt’s proposition of sending jetfighters to Lybia, and most recently, announced its support for the Swedish participation with troops in the military occupation of Mali. One important aspect in this “deformity” consisting in, according to Anna Jardfelt (CEO of the Swedish Foreign Policy Institute), that Sweden is taking part militarily, with troops, in regions of the world that are not in the political priorities of Sweden. This military participation of Sweden is said to be implemented in the frame of EU-cooperation. But the truth is that these operations basically correspond to NATO design and operative command. No doubt Sweden has revealed itself been the closest collaborationist European country of the Bush and Obama government, and nowadays has repeatedly been referred in the international media as to “the Sixth Eye” of the SIGINT alliance under US command. First, there is no doubt whatsoever, the US government approached Sweden’s authorities on the situation around Julian Assange and the WikiLeaks exposures in 2010. The meeting in Stockholm was reported by the Swedish press. Secondly, as reported in both the Phillip Shenon and NSA documents (the report by Greenwald & Gallagher in The Intercept), the US contacted all countries with forces in Afghanistan with the request to initiate prosecution against the WikiLeaks founder. As being Sweden a principal country participating with military troops in Afghanistan, it is beyond discussion as to whether Sweden was also among the nations contacted by the US for that purpose. My conclusion being that it is highly likely that the reopening of the “case Assange” by Swedish authorities on the 20 of August 2010 was part of the US request of the 10 of August to prosecute Julian Assange by any means. See now this account of the European Arrest Warrant against Julian Assange, which I previously published in a rebuttal I wrote regarding declarations of lawyer Elizabeth Massi Fritz in Svd 2014. The conclusion is evident: the real target of the EAW was not the detention of Assange, but the creation of an extradition process. What was to be gained by the EAW? In fact, ONLY SWEDEN among countries with forces in Afghanistan initiated a prosecution against Julian Assange, in a case reopened JUST DAYS AFTER the US request to allies mentioned in The Intercept report of 17 February 2014, on the Edward Snowden documents. Claes Bogström. “Därför är ett förhör i England otillräckligt”. SvD, 19 Feb 2014. Alexa O’Brien. ”Newly published secret grand jury orders & other docs shed light on US investigation of WikiLeaks now entering 5th yr”. Alexaobrien.com, 17 Feb 2014. “My debate with Expressen’s Editor-in-Chief on Swedish Radio One. wich The anti-WikiLeaks campaigns”, Professors blog, 29 Feb 2012. Swedish journalists have in multiple occasions conspired to protect the interests of those in power. One illustration I given during the anti-WikiLeaks campaigns of 2012 which I referred as a “Plan Z” aimed to save minister Carl Bildt. See a) “Anatomy of an untruthful scoop: Sweden’s psychological warfare against WikiLeaks, and the political case VS Julian Assange. Part One”, 23 Feb 2012, and b) “Plan Z: the latest nationwide anti-WikiLeaks campaign in the Swedish media”, 2 March 2012. “På det svenska Utrikesdepartementet förnekar man att man kontaktats av USA. “Emanuel Karlsten: Konspirationsteorierna kommer att flöda”. Expressen, 20 Sept 2010. “Sweden, NATO and Assange”. Professors blog, 3 Nov 2011. The “shadow foreign-affairs minister” Urban Ahlin has also been disclosed in the Wikileaks diplomatic cables. Swedish paper Expressen published at that occasion the article “Wiklieaks discloses: Ahlin wanted to sell the (Afghanistan) war to the Swedish people in this way“. Namely, Urban Ahlin had asked at a meeting in the US Embassy in Stockholm, that US should send to Sweden a local politician from Afghanistan in order to tell the Swedes “affective-impacting” stories. This would further increase the support from the Swedish people towards the military occupation, reasoned Ahlin. Urban Ahlin has of course tried to deny that such conversations had occurred and dismissed it as “Wikileaks’ lies”. Nothing happens afterwards; he was not further questioned by any Swedish journalist and he is still Sweden’s “shadow foreign-affairs minister”. 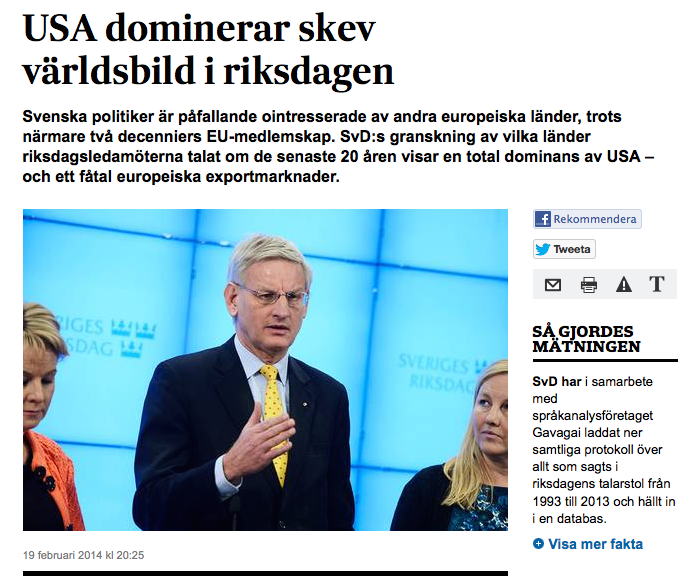 USA dominerar skev världsbild i riksdagen, SvD, 19 Feb 2014. Many times I have asked Swedish media if and why US wish to get their hands on Julian Assange. Some journalist have answered me that “he deserves it”. It seems that many Swedish journalist have taken a private disliking of mr Assange, something I have answered back but of course never get a respond… To me the case is obvious, US wants him, like they wanted and got, by decision of the Swedish government, the two Egyptian-Swedes sent to prison in Egypt 2001. What Is Behind The Bogus Case of Sweden VS. Mr Julian Assange? The Board-Members affiliations of Swedish Foreign Minister Carl Bildt. . .